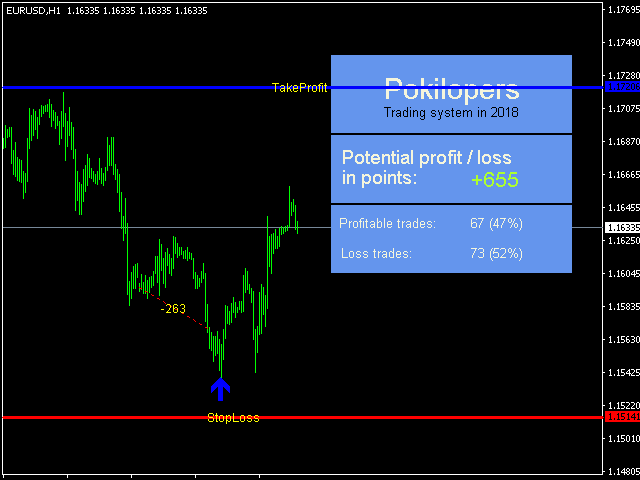 Pokilopers - the finished trading system is presented as an indicator for the Metatrader4 platform. When added to a chart, Pokilopers automatically analyzes the situation on the market, determines the direction of the trend, resistance points, the price movement channel and other market factors that affect the current and future price movements. 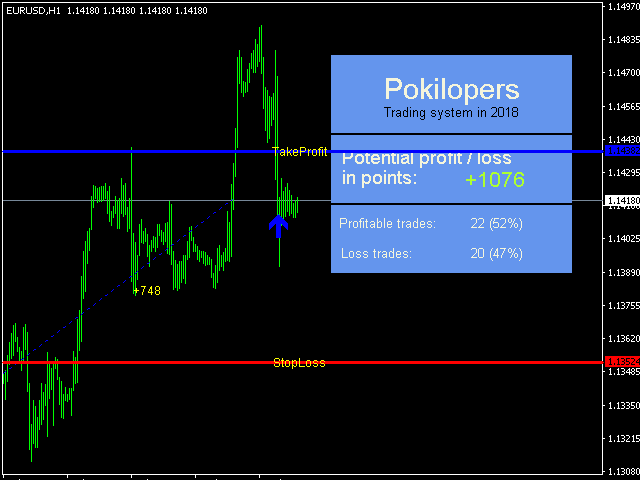 After that, Pokilopers automatically determines the most effective point for opening a trade and gives the trader a signal in the form of an arrow. 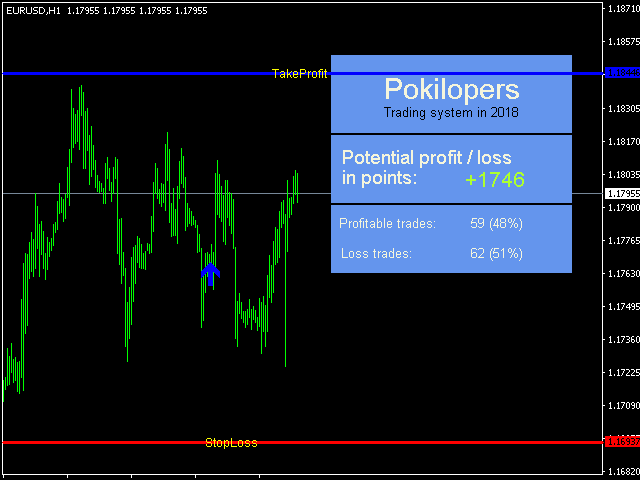 After a signal to open a trade, Pokilopers draws two lines on the chart: TakeProfit and StopLoss. When the price reaches any of these lines, it is recommended to close an open order. 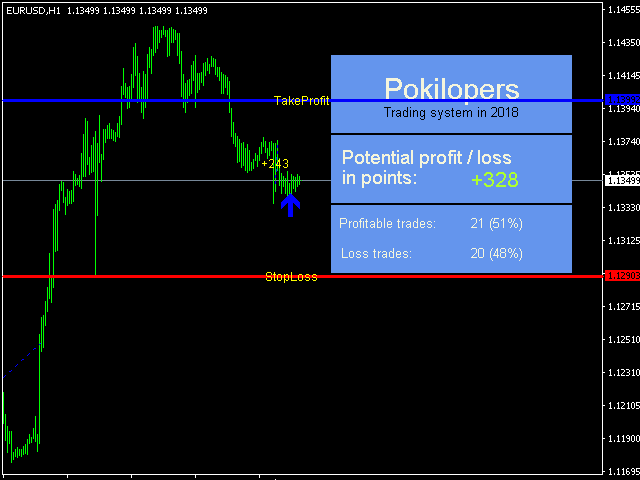 In the additional information window on the chart, Pokilopers counts profitable and unprofitable transactions, as well as profit or loss in points. This information is displayed as a guide for the trader. This information also helps the trader to choose the right settings for the indicator Pokilopers. By default, the indicator settings are for the EURUSD H1 timeframe. You can choose the indicator settings for any other currency pair. If you are unable to do this by yourself, please contact us in a personal message and we will help you find effective settings. TakeProfit - this parameter affects the algorithm for calculating the TakeProfit level. StopLoss - this parameter affects the algorithm for calculating the Stop Loss level. acceleration_factor - parameter to calculate the points of opening orders. Affects the frequency of occurrence of signals. price_increment - the parameter controls sudden changes in the price range. inform - displays the information panel on the chart. Color_panel - sets the color of the information panel.